NARNIA: The Musical is a dramatization of The Lion, the Witch and the Wardrobe, the first and most famous of acclaimed British author C.S. Lewis’s world-renowned series, The Chronicles of Narnia. It tells of four English schoolchildren – brothers and sisters – sent away from London during World War II to stay in the manor house of their uncle – who stumble upon (and through) a wardrobe into the magical kingdom of Narnia, held in the power of the White Witch, whose evil spell has frozen the land, so that it is “always winter – and never Christmas.” They are embraced by the talking animals, the good Narnians who resist the Witch’s evil and await the return of Aslan – the Great Lion, who is their rightful ruler. Aslan, who has long been absent from his land (so that some have even doubted his existence) has – at last! – returned, to confront the Witch, and the children are soon caught up in a fierce struggle of good versus evil. In this spellbound landscape, filled with creatures of myth and fable, the children face temptation and fear, but learn deep lessons of courage, unselfishness, and wisdom that help them grow in spirit and prepare them for life in our world. Narnia wants to sing, and from the excitement of the opening number “Doors and Windows”, to the the poetry of “Narnia (You Can’t Imagine),” to the stirring “To Make the World Right Again,” your spirits will soar with all those in this enchanted land. 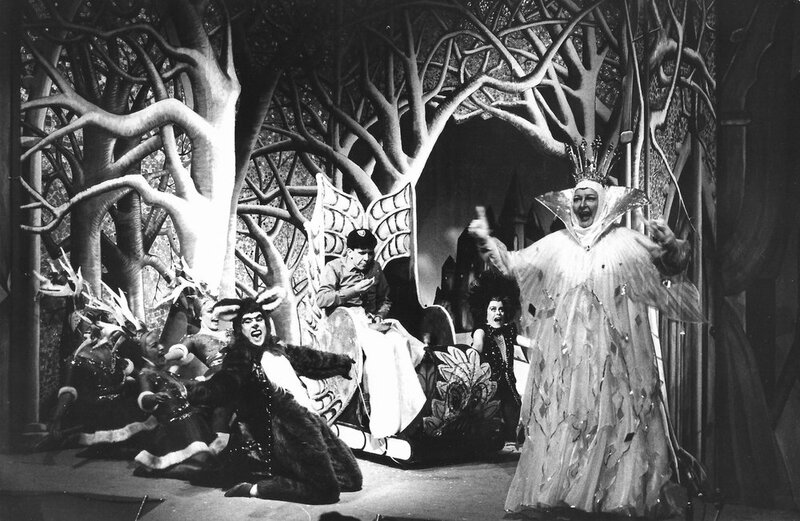 NARNIA: The Musical has been performed by many professional and amateur theater groups since the 1980’s. It’s first production was at PCPA Theaterfest in Santa Maria, CA and there have been more than 1000 productions worldwide since. It played for the City of London Festival in 1986 and that production came to Off-Broadway in New York where it was critically acclaimed. In 1992 TheaterWorksUSA, America’s foremost producer of theater for young audiences, began touring a one hour version of the show, and continued this national tour for 25 seasons. The musical is appropriate for production at Christmas (snow and St. Nicholas) as well as Easter (sacrifice of Aslan and his “resurrection”), but can be produced during any season. Two versions of NARNIA: The Musical are available for licensing from Dramatic Publishing Company – the full length in two acts for 11-16 actors and a shorter 70 minute version that can be performed by 8-12 actors. The music can be performed by single piano or by a small orchestra. A customizable poster and other materials are available for production needs. See Music section for music samples from the show. To license NARNIA for your theater, go to the Licensing page to contact Dramatic Publishing. To inquire about booking a one hour live touring production, contact TheaterWorksUSA on the Licensing page. “A very nice place to visit. ‘NARNIA,’ a deft musical adaptation. “Move over ‘Nutcracker’ and make room for ‘NARNIA’. "CYT North Idaho began in 2007. We have performed over 30 shows. Narnia the Musical was the first show we ever produced where we SOLD OUT all 12 performances! The public loved it! The story of course is adventuresome displaying a power struggle between good and evil and most importantly, a story of Redemption. We cast 82 children and the word spread quickly about what a wonderful production it was. Four of our performances were for school children to come with their class during school hours as a field trip. Surprisingly to many, was the engaging, beautiful and sometimes haunting music. The music was an intricate part of the show. We will definitely do this show again!" "This play is absolutely fabulous ... by far the best that we have ever produced. The script is extremely well written, the music is wonderful, and the lyrics are awesome. The authors have brought the well-loved story to life and not only were true to the original but also added a delightful touch of humor." "This is a powerful story. It's the salvation message in a cool symbolic way. The diversity between the children and all the complex Narnians is so fun to play with. I feel the authors served the C. S. Lewis book well. "Field of Flowers" is the best song from your [Dramatic Publishing's] library I've worked with." See Contact Us for a form for obtaining a full demo CD of the score (recorded by the authors for non-commercial use). Jules Tasca (Book) is a Philadelphia based award winning playwright. He has taught playwrighting at Oxford University in England and is the author of over 130 produced and published plays. His works have been done in English speaking countries all over the world. He has been selected five times to be included in The Best American Plays Series published by Applause Books. He wrote the libretto and songs for a new Jazz opera that showcased in Philadelphia. This Barrymore award recipient’s last production was March Madness-Shhh! It was produced at Theater Three in New York, and the Dramatic Publishing Company has just released his anthology, Macabre, based on the work of Edgar Allen Poe. Thomas Tierney (Music) Composed ELEANOR - An American Love Story at Ford’s Theatre in Washington and many other U.S. theatres, including Musical Theatre West, Pittsburgh Public Theatre and Marriott’s Lincolnshire Theatre (Chicago). Other shows: Diamond and the North Wind (Winter Park Playhouse New Works Festival), Jungle Queen Debutante (Seattle’s Village Theatre in Issaquah, New York’s National Alliance and NYMF Festivals), Off-Broadway’s Pets!, The Dream Team at Goodspeed Opera, Tommy Tune’s one-man show Ichabod - and recently The Year of Living Dangerously at Feinstein’s/ 54 Below in Manhattan. His work for young audiences includes six shows for Theatreworks/USA. He wrote AT&T’s theme song for Disney’s EPCOT Center, has performed his own music at Lincoln Center and the White House and has won numerous ASCAP awards. For more information about his other musicals and projects, click on www.thomastierney.com! Ted Drachman (Lyrics) began in theater at Harvard, and writing/acting/improvising for the long-running Cambridge, MA revue, The Proposition. He collaborated on book, music, and lyrics for Work & Win!, an Horatio Alger musical, and wrote lyrics for 3 Theatreworks/USA TYA shows, Susan B!, The Amazing Einstein and The Lion, the Witch and the Wardrobe. His lyrics for an updated version of the classic operetta were heard in the Goodspeed Opera House’s production of The Chocolate Soldier, and in Glimmerglass, a musical based on James Fenimore Cooper’s Leatherstocking Tales, also produced by Goodspeed and at The Spirit of Broadway Theater in Connecticut, where it won a Spirit Award for “Best New Work"; the show was also a Finalist for the Richard Rodgers Award. For a decade, he was a preliminary judge for the Kleban Award for lyricists. C.S. Lewis (author of novel) was a high-powered Oxford and Cambridge professor and one of the 20th century’s most famous converts to Christianity. An atheist from boyhood, he converted at age 33 and devoted much of the rest of his life to writing about faith. His series of allegorical books known as The Chronicles of Narnia remains especially popular with children. (The Lion, the Witch and the Wardrobe, the first book of the seven in the Narnia series, was published in 1950; The Last Battle, the final book, was published in 1956.) Lewis taught at Magdalen College, Oxford, from 1925-1954, when he moved to Magdalene College, Cambridge, where he remained until 1963. Lewis and his close friend J.R.R. Tolkien were part of the casual Oxford literary group known as The Inklings. The Lion, the Witch and the Wardrobe was made into a 2005 feature film with Liam Neeson providing the voice of Aslan, the heroic lion. 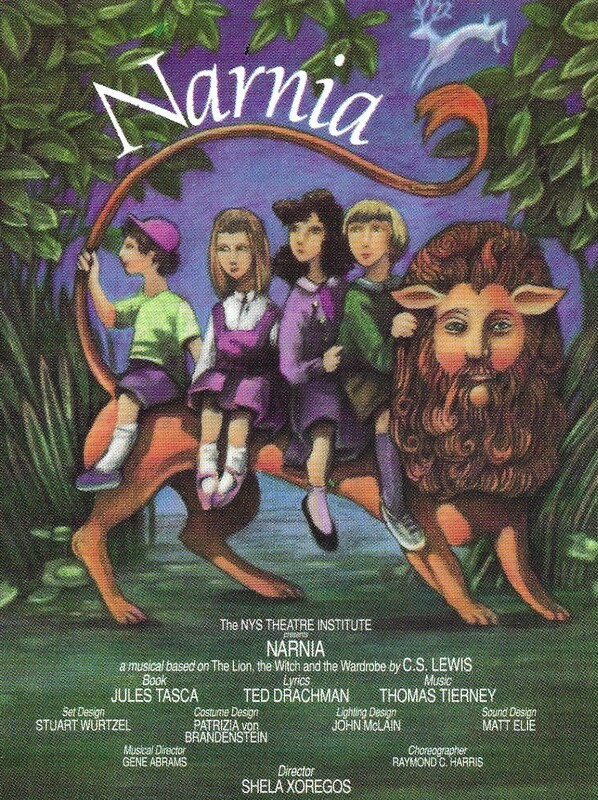 To license the full length Narnia the Musical for your theater, please click below. Cast size: 7 to 10m., 4 to 6w., extras as desired. Cast size: 8 to 12 with doubling - 4m, 4w - or 7m, 5w. Bring the Tour To yOu! Called The Lion, the Witch and the Wardrobe by TheaterWorksUSA, this one hour touring production of Narnia the Musical can be brought to you. To inquire how to bring the TheaterWorksUSA touring production to your school, theater or venue, please click below. Select "other" and in Comments, write "The Lion, the Witch and the Wardrobe". In 1885, Charles Sergel, a journalist and a young man with a lifelong interest in theatre, founded The Dramatic Publishing Company in Chicago, Illinois. For five generations, the company has been committed to developing and serving the authors, artists and educators who comprise the world of theatre. Our catalog includes musicals, full-length and one-act plays and high-quality theatrical books suitable for high-school, children's, professional and community theatre. We offer a spectrum of plays for every cast size, skill level and audience representing classic and contemporary works. We embrace plays that ultimately challenge audiences, actors, producers, students and educators to examine their beliefs on controversial topics like bullying, prejudice, racial issues, poverty, religion and cultural differences. We pride ourselves on offering a level of personalized service and support to our customers and authors that surpasses the industry standard. Use the form below for a full demo of the score. Designate Full Length (11-16 actors) or Shorter (8-12 actors) version. Twinsun Music can provide an archival CD demo ($12 shipping & handling). Please tell us the name of your theater, location and if you have obtained the performance rights from Dramatic Publishing.